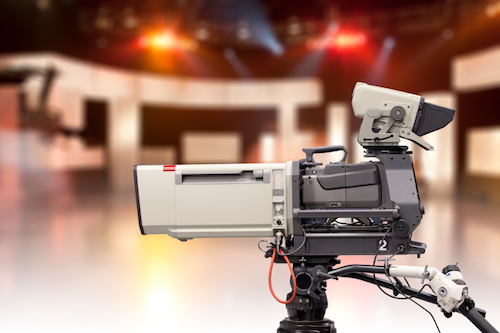 Media producers who are on top of their game know that they need to be hiring professional voiceover talents who can offer the most current, bookable voice styles. Those sound styles that advertising agencies or clients hear elsewhere on TV, radio or the web and want for their audio branding. Or unique vocal styles that actually aren’t heard everywhere and are very new but stand out and break through the audio branding clutter. For me as a voice talent, I share those bookable and unique vocal styles with my voice demos and in this case, my new commercial voiceover demo for 2018. Combining voiceover work I’ve done with vocal styles and reads recommended by my Los Angeles-based voiceover coach, Mary Lynn Wissner, as well as the legendary demo producing skills of Dan Friedman, my new commercial demo highlights all of those bookable and unique sounds producers are looking for right now. If I were to tell you my new commercial voiceover demo sounds great, that would be egotistical and self-serving – which would be embarrassing and soooo beneath me. 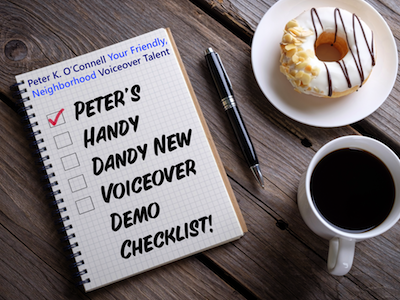 peter’s handy dandy new voiceover demo checklist! Having completed my new commercial voiceover demo, I say with modesty, not bravado, that I am pleased with the results. I hope clients and prospects will like it as well because they are every demo’s intended audience. However, I intentionally reminded myself recently to keep all the hard work of these past few months of demo pre-production, production and post-production in the proper perspective. 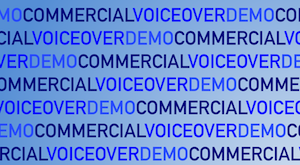 Here, now, is that perspective: it may crush the souls of many professional voiceover talents but the truth must come out: nobody – not one single person among your clients, agents or prospects – is AS excited about your new release voiceover demo as you are. Yes, that demo…that creatively grew inside you and was meticulously birthed from inside an acoustically perfect studio and lovingly mastered by the finest audio doctors and nurses and is now ready to proudly be shared with the world…is mostly seen by that world as just another voiceover demo. Gentle voice talent, no, the world generally doesn’t share your enthusiasm for this hard fought piece of audio. It’s not that the demo is bad (unless it is, yet probably really isn’t) but to them it is just ‘another demo’. Aw pal, don’t be bummed. You just have to look at your demo differently. The trick is, my friend, if you cannot make the world care about your new demo, then you must focus on making the world aware of your new demo. So now, even though most of these folks might not care you have a new demo, they will be aware of it. Using any or all of the above tools to create that awareness (and maybe even subliminally some sense of excitement or urgency) might make some of your audience care about the your new demo. At least it should bring you to top of mind awareness in casting for a while. Just remember that although you are justifiable proud of your new demo, sometimes the new demo isn’t the MOST important part. The valuable part of a new demo could just be opportunity to use the demo as a respectful and professional tool to communicate new and “interesting” news to prospects and clients to create awareness about YOU. 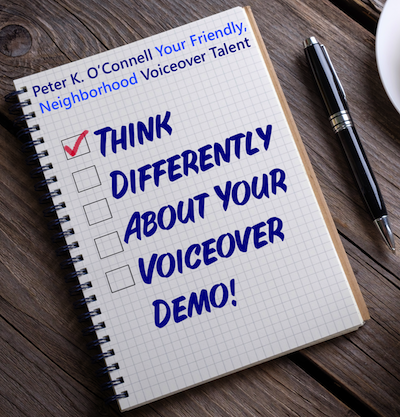 The demo is your sound (and vital to your VO business) but you are the brand. And just between us kids, I know how much better you sound on the new demo. You’re great! Nice job on the new demo!